Our newly purchase cobweb master! For quite sometime we don't have this in our work place that is why its hard to clean up the ceiling and wall. There are numerous cobwebs sprouting like seed and when you ignore after 3 or 4 days you'll notice they have increase.So to tidy it I just use the simple broom or broom stick and attached it to a long wood. 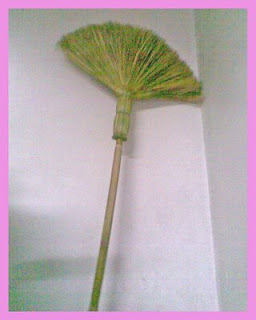 Just this morning a woman sold this to us for 80.00 pesos, since I have been looking for this I told to my boyfriend to buy it.Now this can aid me to clean the ceiling and wall easily.